Commander Ron Ireland, a Chief Warrant Officer 5, who just completed his fifth deployment leading eight members of Detachment 14, Operational Support Airlift Command in Afghanistan, shows off a special license plate that says, "Thanks" given to him by Brewer veteran and troop greeter Charles "Dusty" Fisher (not pictured) to Lt. Col. Brian Veneziano, the State Aviation Officer. "We're going to have to find a place to display this," Ireland said. Jennifer Noke, wife of Sgt. Luke Noke of Detachment 14 OSACOM, is honored at the Maine Army National Guard unit's freedom salute on Sunday, Feb. 2, 2014, for the support she provided to the unit, which recently returned from Afghanistan where its members conducted intelligence, surveillance and reconnaissance missions. Brig. 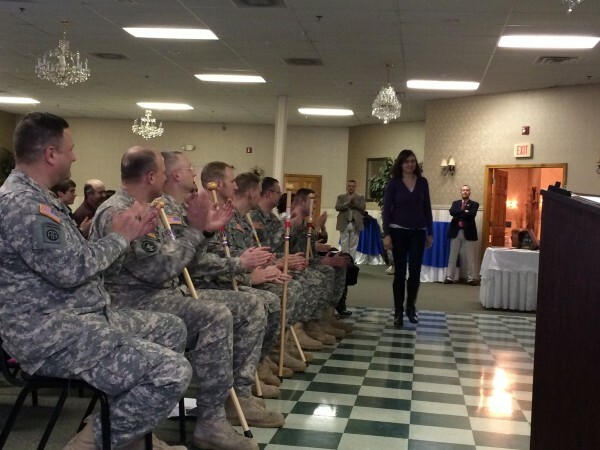 Gen. James Campbell, adjutant general for the Maine National Guard, thanks eight Maine Army National Guard members of the Bangor-based Detachment 14, Operational Support Airlift Command and their families at the unit's freedom salute on Sunday, Feb. 2, 2014. Gov. Paul LePage, U.S. Rep. Mike Michaud, and other dignitaries also thanks the soldiers and their loved ones. 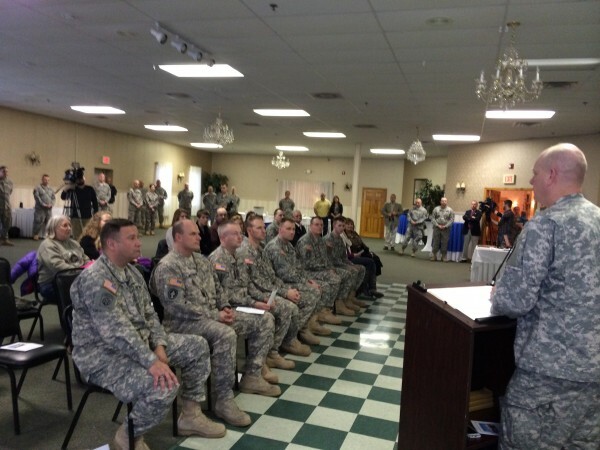 BANGOR, Maine — The eight soldiers from the Maine Army National Guard’s Detachment 14, which included seven who had deployed at least one time before, aptly returned from a yearlong deployment training and conducting secret Afghanistan intelligence, surveillance and reconnaissance on Veterans Day. “It was a secret mission. It was the kind of stuff where everybody had to have top-secret clearance to go,” Commander Ron Ireland, a Chief Warrant Officer 5, who just completed his fifth deployment. The four pilots and four air support staff members of Detachment 14, Operational Support Airlift Command [OSACOM], were given a hero’s welcome home at the unit’s freedom salute Sunday at the Spectacular Event Center. The event publically recognizes the sacrifice of soldiers, families, employers and friends who have supported them throughout their deployment. The unit flew more than 4,000 mission hours in the war-ravaged country and provided much needed intelligence, according to Brig. Gen. James Campbell, adjutant general for the Maine National Guard. The unit, which operated fixed-wing airplanes, deployed to Bagram, Afghanistan, with five other states to become Bravo Company, under the command of Task Force ODIN. The Maine unit provided intelligence, surveillance and reconnaissance support to the International Security Assistance Force, Maj. Michael Steinbuchel, spokesman for the Maine Guard, said in a press release. After thanking the soldiers and their families, both Gov. Paul LePage and U.S. Rep. Mike Michaud spoke passionately about continuing benefits for members of the military. 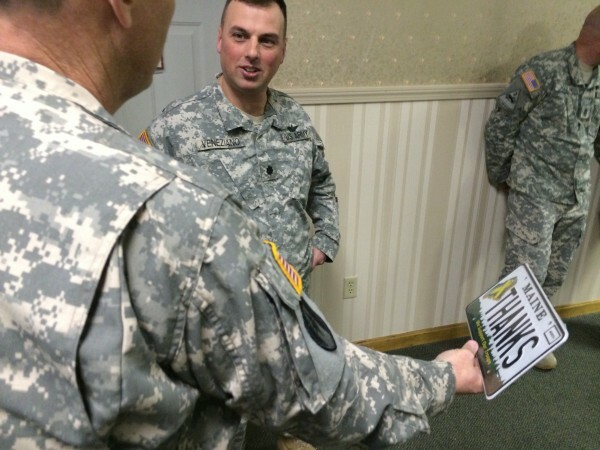 Greenbush resident and 25-year military veteran Lee Burnham, who served in the Air National Guard, U.S. Army, and the Army Reserves, was on hand to give out veteran walking sticks provided by the Cole Land Transportation Museum. “You are the backbone of this country,” Burnham said. When Ireland got to the podium he thanked the soldiers he served with for their dedication, made a few jokes about those who worked the night shift compared to the day shift and thanked his wife and family for standing beside him. He ended by saying the soldiers who replaced the Maine unit recently suffered losses when a plane went down killing three. “The fight is still going on,” Ireland said. Campbell told those in attendance, which included some 20 others in uniform, to keep in mind there are still Mainers and other U.S. soldiers in harm’s way. The veteran members of Detachment 14 OSACOM under Ireland’s command include: Sgt. 1st Class Brad Merrill, (4th deployment), Chief Warrant Officer 4 Mike McGovern (4th); Chief Warrant Officer Todd Lidback (3rd); Chief Warrant Officer 2 Dane Rasmussen (2nd); Sgt. 1st Class Justin Anderson (6th); Sgt. 1st Class Kevin DePrenger (3rd); and Sgt. Luke Noke (1st). DePrenger had a work conflict and could not attend. “I’m just glad to be home,” Anderson said at the end of the ceremony as he picked up his walking stick to leave.